Content: The only thing I can think of is that some of the vocabulary (like synchronicity or textured soy protein or materialized) might make it challenging for younger readers. It’s in the middle grade (grades 3-5th) section of the bookstore. Fresh off their last adventure, both Mr. and Mrs. Bunny and their human friend Madeline are finding life a little boring. Madeline’s still stressing about money (thanks to her parents’ — Flo and Mildred — lack of foresight), and most especially about a college fund. Mr. and Mrs. Bunny are back to squabbling and comparing themselves to their uppity neighbor Mrs. Treaclebunny. But never fear: adventure is in the cards. 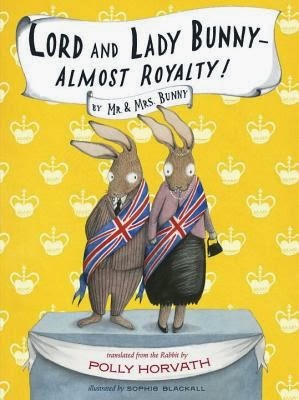 Flo and Mildred discover they’ve inherited a candy shop in a small English village and Mr. and Mrs. Bunny decide to head to England on vacation. Of course they meet up on the cruise ship ride to England from Victoria, Canada (implausible, I know — but some of the funniest scenes are on the cruise ship), and of course madcap farce ensues. I don’t know if it was my mood, but I didn’t find this one as funny as the first. Maybe it was because it was very much the same thing over again, and not being New and Fresh, it wasn’t as enjoyable. But I also think it was because there was a lack of a consolidated conflict. In the first book Madelline and the Bunnys had to save Madeline’s parents from the bad foxes. This time, they were just going across the ocean and puttering about England trying to raise money. Not as, well, interesting in my book. “No. Canadian.” When would they learn to tell the difference? I was also amused at the meta part where Mrs. Bunny ended up at a book signing that the “translator” of the first book was at. Because, well, the humans think the translator is making things up, and Mr. and Mrs. Bunny don’t exist. It was pretty amusing. But, in the end, it didn’t tickle my funny bone the way the first one did.